AppleInsider | Rumor: Apple investigating USB 3.0 for Macs ahead of Intel – Carpet Bomberz Inc.
A new report claims Apple has continued to investigate implementing USB 3.0 in its Mac computers independent of Intels plans to eventually support USB 3.0 at the chipset level. via AppleInsider | Rumor: Apple investigating USB 3.0 for Macs ahead of Intel. This is interesting to read, I have not paid much attention to USB 3.0 due to how slowly it has been adopted by the PC manufacturing world. But in the past Apple has been quicker to adopt some mainstream technologies than it’s PC manufacturing counterparts. The value add is increased as more and more devices also adopt the new interface, namely anything that runs the iOS. The surest sign there’s a move going on will be whether or not there is USB 3.0 support in the iOS 5.x and whether or not there is hardware support in the next Revision of the iPhone. And now it appears Apple is releasing two iPhones, a minor iPhone 4 update and a new iPhone 5 at roughly the same time. Given reports that the new iPhone 5 has a lot of RAM installed, I’m curious about how much of the storage is NAND based Flash memory. Will we see something on the order of 64GB again or more this time around when the new phones are released. The upshot is for instances where you can tether your device to sync it to the Mac, with a USB 3.0 compliant interface the file transfer speed will make the chore of pulling out the cables worth the effort. 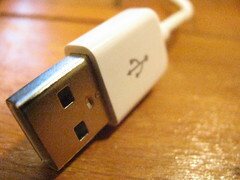 However, the all encompassing sharing of data all the time between Apple devices may make the whole adoption of USB 3.0 seem less necessary if every device can find its partner and sync over the airwaves instead of over iPod connectors. Still it would be nice to have a dedicated high speed cable for the inevitable external Hard drive connection necessary in these days of the smaller laptops like the Macbook Air, or the Mac mini. Less space internally means these devices will need a supplement to the internal hard drive, one even that the Apple iCloud cannot fulfill especially considering the size of video files coming off each new generation of HD video cameras. I don’t care what Apple says but 250GBs of AVCHD files is going to sync very,…very,… slowly. All the more reason to adopt USB 3.0 as soon as possible.